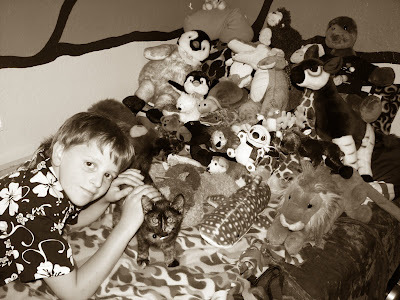 My son has the coolest collection of stuffed animals...all over his bed. How he sleeps is beyond me, but he does... with his friends all around him. There is Blazer the giraffe, Oton the okapi, Cam-O-Gator the alligator, Gentle Giant the whale shark, Buffalo Bill, a buffalo, of course... and penguins- Mumble, 'Guin & Sleddy... turtles- Stone & Rock... Quite a unique collection. At eleven, I don't see any signs of them being packed up or even set aside on a shelf. I love that. He is comfortable in who he is. Eleven is one of those weird ages- barely still little boy, and just starting to race off to be a teen. I want to hold on to that little boy part... the part with the stuffed menagerie... the snuggling on the couch... the sweet kisses goodnight... and our laughter in the morning. I want it to last forever. Cam's steps have been the ones that make my heart move. I think I was always so excited for Laura's firsts... pre-school, putting her on the bus for kindergarten, whatever came up next. I have just enjoyed it to the fullest, being so excited for the next big step... but with Cam? It's my last "first." The last time I'd send a little one off to preschool for the first time... the last time I'd bring a little one to kindergarten- to big school for the first time. Those times are when my eyes would start to fill up, where as with Laura there was just joy. And so this little boy, who is not so little, will be headed off to middle school in August. How can the time go so quickly? I realize I must relish these quiet, special times with Cam... snuggling up on the couch, waking him up and making him laugh with a silly penguin voice... because soon, sooner than I probably know, it won't be so cool for him to show so much love so openly. So while he is figuring it all out- who he is going to be, and what he's going to do, I will cherish every little boy moment, and I will know that at age eleven, he is just right. I think even when he is 15 he will kiss you goodnight....snuggle with you etc...just not in front of his friends. I am having a lot of FIRSTS too. Yikes. YOu have to read the second one(inspiration) first, and the first one (insert foot) second. I can so relate to this. My son (my only son) just turned 12, and I'm seeing my sweet "snuggle bear" turn into an adolescent all of a sudden. It's very hard. He doesn't like to be hugged in public and good-night kisses are also taboo now. Breaks my heart, BUT I realize this is all part of the 'growing into independence' thing that I am guiding them towards.